The penultimate episode of season four has aired! The climax is approaching, and after last week’s exploration of brutality and corrupted innocence, this week’s was rather soft and cushy by comparison. A good thing too, I don’t know if anyone came away from that one unscarred! In addition, this week also began bringing season 4.5’s various plot threads together – and by that I mean the different bands of characters who, up until now, have been separated and looking for each other. The episode opens with Glenn, Tara, Abraham, Rosita and Eugene carrying on down the railroad tracks and getting to know each other. Along the way, they find another road map with Maggie’s writing on it, telling Glenn to go to Terminus. After running some distance, Abraham tells Glenn they need to stop and rest in a water tower. However, a Walkers emerges from it and nearly lands on them, which sends Tara to the ground, hurting her knee. Tara says she’s okay to walk, and Glenn insists that they keep going. To make it happen, he promises to hand his riot gear over to Eugene to ensure his safety. They come to another message painted on the side of a tunnel, but hear Walkers inside and debate going around. 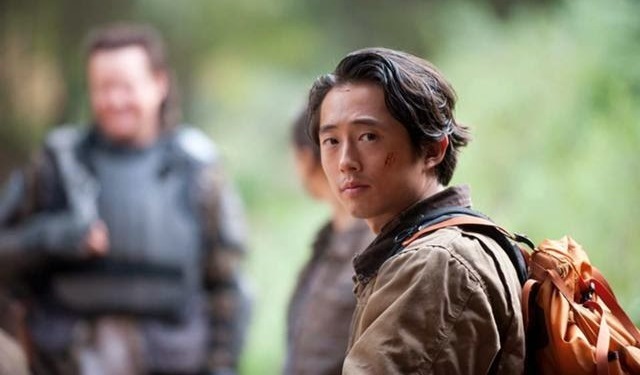 Glenn decides to proceed through with Tara and avoid a day-long detour, but Abraham and his group choose to take the detour route and promise to meet them on the other side. When they get deeper into the tunnel, they find a slew of Walkers pinned under a fallen section of the ceiling. Glenn worries that this would have prevented Maggie and the others from getting through, but Tara concludes that it had to have happened today. Glenn proceeds through it and inspects the Walkers to make sure none are Maggie or the others, and they begin killing them. Once they make it over, they find a dozen or more Walkers on the other side, which begin to approach them. Outside, Abraham, Rosita and Eugene double back to the last intersection and find a vehicle, which they plan to start driving for Washington DC again. However, Eugene insists on navigating and tells Abraham to sleep, then misdirects Rosita so that they end up back on the railroad on the other side of the tunnel, where Glenn and Tara are expected to emerge. Abraham wakes up and they begin to argue, until Eugene warns them of something that’s approaching them from the tunnel. Back in the tunnel, Glenn once again is scanning the faces of the Walkers, making sure Maggie isn’t one of them and finding no traces of bodies on the ground. Tara says they don’t have enough ammo to make it through and insists they turn around, but Glenn demands that they push through. Tara’s leg gets caught by a piece of concrete and she tells Glenn to leave her, which draws the Walkers closer. Glenn tries to fight it out, and they are both saved when a group arrives from the opposite end in a vehicle and opens fire on the Walkers. After shooting them all dead, Maggie runs forward and embraces Glenn. 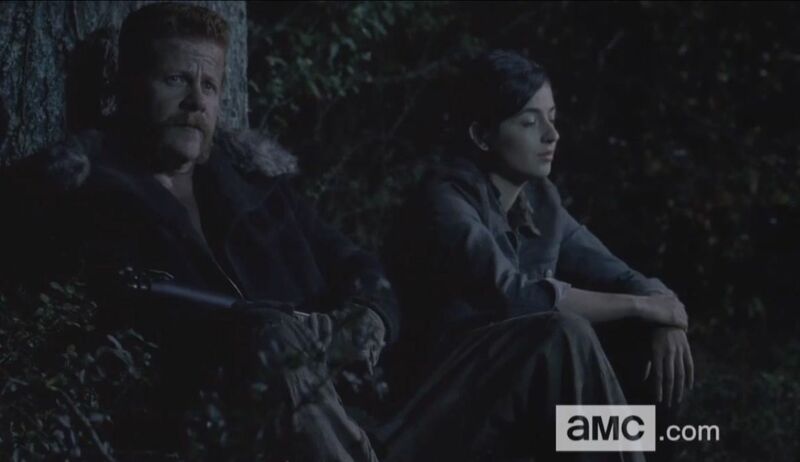 Her group had met up with Abraham, Rosita and Eugene on the road and came in to help them through. They make camp in the cave and introductions are made. Abraham tells them that Eugene knows what caused the walker outbreak and once again says they should head to Washington. But Eugene insists they continue to Terminus first and a consensus is struck. Maggie takes the picture Glenn was keeping of her and burns it, saying he will never need it again. Elsewhere, we catch up with Daryl’s new found companions, the group of armed men led by Joe. 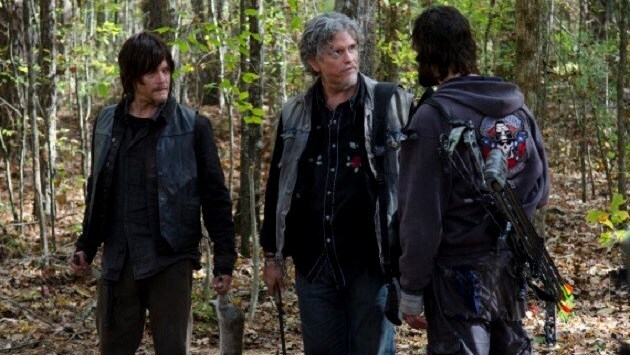 Daryl heads out to hunt and is joined by Harley, and the two begin to fight over a wild rabbit they both have claim to. Joe intervenes and tells Daryl that they live by a strict rules to ensure that things don’t get chaotic. By the rules of their band, everyone is forced to lay “claim” to something and respect it, and he then splits the rabbit between them. As they continue on, Joe insists that Daryl join them since no one can make it alone anymore, despite Daryl’s insistence that he’s better off by himself. He also fills Daryl in on the rules – you claim; if you steal, you kill; and don’t lie – and the punishment for breaking any of them, which is a beating. They take shelter in a rail station for the night, find a bunch of cars inside, and begin claiming them for the night. Daryl, having made no claim, sleeps on the floor. During the night, Harley confronts Daryl and accuses him of stealing his half of the rabbit they killed. Joe inspects Daryl’s bag and finds the missing half, and Daryl accuses him of planting it there. Joe orders that Harley be beaten and tells Daryl that he saw do it. In the morning, Daryl finds Harley’s body outside with an arrow in his head and covers him up. On the road, they see a sign to Terminus, and Joe reveals that this is where they are headed, mainly because they are tracking the guy who murdered one of their own (Rick!). 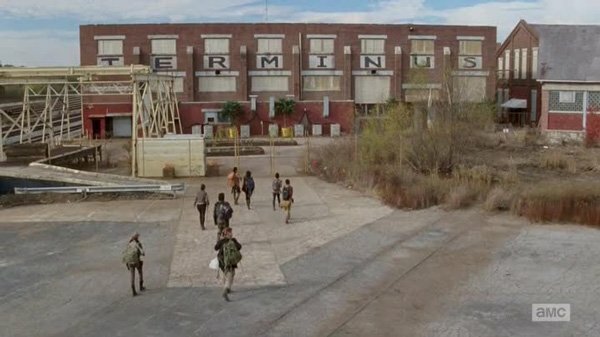 At the end of the line at last, Maggie, Glenn and the others see a building with the name TERMINUS painted on it in large letters. They enter through a gate and find a series of small gardens and come to a large barbeque being tended by a woman. She identifies herself as Mary (though Trekkies and geeks will probably recognize her as Tasha Yar), and welcomes them to Terminus. Straight off the bat, let me say that I enjoyed this episode. It had just enough twists and turns to be interesting, and revealed enough that it was enjoyable. At this point in the season, that is to be expected since they can no longer afford to drag things out or confound viewers with 11th hour complications. I was glad for that much. I was also pretty pleased with the way they answered some important questions and brought key members of the cast back together finally. Naturally, the big focus of this episode was the reunion of Maggie and Glenn, something which we’ve been waiting for since season 4.5 started. And I liked how they went about doing this, showing one group retracing the others’ steps and then meeting up in the middle. But another thing I enjoyed just as much was the way they revealed Joe and his group’s story. For some time now, we’ve been seeing them pop up and wondering what their angle in all this is. Obviously, they are a bunch of marauding survivalists that no one in their right mind would turn their back on. And Daryl’s involvement with them represents a conflict which is sure to be resolved next week (echoes of Merle’s involvement with the Governor here…) But I also wondered if they were related to Terminus at all, if it was their base camp or a trap they were leaving out for unsuspecting wanderers. I also wondered if they played any role in Beth’s disappearance. Now, it would seem that they are just an armed group of survivalists looking to make their way and take from others. The reason they are heading towards Terminus has everything to do with their last encounter with Rick, and apparently nothing to do with the town itself. And Beth’s disappearance? Well, that wasn’t revealed, but I’d bet dollars to doughnuts this Terminus community is a cooky social experiment and she was kidnapped by them because they are looking for women of child-bearing age. Seriously, anyone want to take that bet? Ah yes, and at last, we got a glimpse of the place itself and now know that it does in fact exist. We did not find that the place was overrun and the promise of salvation it once offered had expired long ago. Nor was it an obvious trap where men with guns jump out and murder anyone willing to accept the invite. If anything – and this is a key part of that bet I’m making – it’s Woodbury 2.0, a seemingly nice community who’s happy exterior hides a dark and sinister interior. In any case, that and other things will be answered next week. And as the sneak peak shows, we will be hearing from Rick, Michonne and Carl; who I imagine will have some ‘splaining to do once the marauders catch up with them. And of course, it won’t end well, mainly because things never do on The Walking Dead. Actually, they never really end at all. They just keep going and going, despite themselves. But in a post-post-apocalyptic landscape beset by rotting zombies and evil people, what else can you do?